The excessive number of alarms in hospitals and clinics undoubtedly leads to a desensitization of hospital and clinic staff ("Alarm Fatigue"). 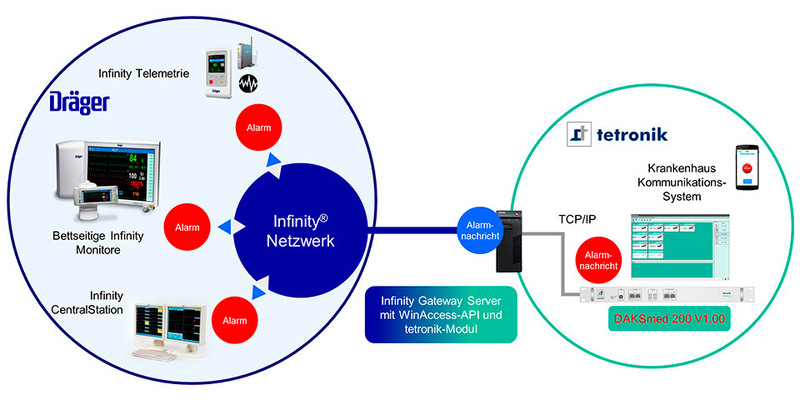 With the distributed alarm system consisting of DAKSmed, Dräger Patient Monitors, Infinity Gateway and mobile handsets, you can forward these alarm conditions to mobile devices in a highly individual way and customized to your individual needs. Hospital and clinic staff receive fewer and at the same time more targeted alarm messages which empowers them to immediately tell vital from uncritical messages and to respond adequately right away. Use the easy DAKSmed browser-based user interface to select and assign the different patient care services, beds and alarms and support your individual hospital workflow in an optimum way. Assign e.g. specific types of alarms or alarms from specific patient beds in a targeted way to the right nurses and fully mapped to the individual shifts. Also, whenever a nurse is unable to take an alarm, e.g. because he/she is already attending to another patient, the DAKSmed user interface on the handset helps to quickly escalate the alarm message to other colleagues and to make sure that no important alarm is ever delayed (functions depending on device type). In addition, the mobile handsets can be used to call for help straight away, especially in difficult situations when every second counts. Support your deeply committed caregivers even further in their daily mobile work routine by complementing your Distributed Alarm System with the convenient operating help DAKScommunicator. The individual components of the distributed alarm system jointly ensure that patient-related, personalized alarm signals are instantly forwarded and distributed to the right doctors, nurses and caregivers. Apart from local alarm signals, DAKSmed can also generate alarm signals away from the patient. Customized to your individual hospital environment as well as to the acuity level of your patients, both at their bedside and during transport. Including Infinity Gateway. Enable you to instantly receive and confirm both text and voice alarm information. DAKSmed distributes alarms from patient monitors to the DAKS-Communicator devices in a fully reliable and highly targeted way. This brings more assurance to nurses and caregivers as it enables them to move about freely while being genuinely assured that they will immediately receive any alarm from their patients, and with all details. This makes it possible to monitor several patients at the same time, without having to be physically located in their direct and immediate vicinity. With DAKS-Communicator, nurses and caregivers are empowered not only to detect alarms when not at the patient's bedside - they immediately see what type of alarm was raised. This important information allows both to determine the necessary steps that need to be taken and respond accordingly, or forward the tasks without any delay. Because it is worn directly the body and successfully designed for easy and intuitive hands-free operation, DAKS-Communicator genuinely supports an uninterrupted workflow. With DAKS-Communicator, nursing staff and caregivers are able to work more confidently, reassured, with highest focus and alertness. DAKS-Communicator is designed and optimized to best possible mobile workflows with audio, messaging and voice communication, meeting even the strictest company and business requirements when it comes to usability, availability, sturdiness and dealing with sensitive data. Receive and read text messages without having to take the device into your hands or out of the pouch. With output of text messages on the high-contrast OLED display right at the device's top, or in form of voice announcements generated through text-to-voice conversion. Control all messages with user-friendly, readily accessible operating buttons. Accept calls via easy-to-use operating buttons and make calls hands-free, with no interruption or disruption of your workflow. Use the double-sided red alarm buttons to launch normal or silent emergency calls. Automatic alarms, e.g. when a man-down or no-movement emergency occurs, provide vital additional personal protection and safety at work.